Collingwood, a town of Simcoe co., Ontario, Canada, on the S. shore of Georgian bay, 72 m. N. W. of Toronto; pop. in 1871, 2,829. It derives its importance from being the northern terminus of the Northern railway, whence steamers connect with the N. shore and with ports on Lake Superior. Two lines of steamers ply between here and Lake Superior. Collingwood, a suburb of Melbourne, Australia, situated on low ground between that city and the Yarra Yarra to the northeast; pop. about 19,000. It is almost a town of itself, having a council chamber, banks, numerous churches and public buildings, and many manufactories. Colne, a market town of Lancashire, England, on the Colne, an affluent of the Calder, 26 m. N. of Manchester; pop. about 8,000. It is one of the most ancient seats of woollen manufacture in England; but since the introduction of the cotton manufacture, toward the close of last century, the population has been chiefly employed in producing cotton goods for the Manchester market. 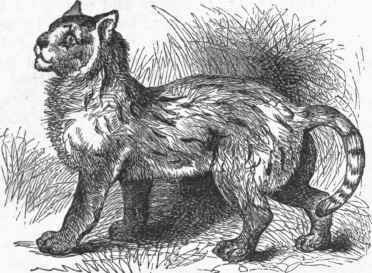 Colocolo (Fells Ferox), a large cat of the size of the ocelot, living in the northern parts of South America. The color is grayish above, white below, with black longitudinal streaks on the body and limbs, and the tail with partial black rings,, the stripes edged with tawny. It is very savage, and commits great havoc among the monkeys and small mammals of Gniana. In its flat and wide head, large rounded ears, stout limbs, and short tail it somewhat resembles the African serval. Colonsay, one of the Hebrides or Western islands of Scotland, S. W. of Argyleshire, between the isles of Islay and Mull, and connected at the S. end. with that of Oronsay, from which it is separated at high water only; pop. about 800. Including Oronsay, the length is 12 m., the breadth from 1 to 3 m. A great portion of the soil is well cultivated, producing potatoes and barley; and cattle and sheep of a superior breed abound. The cod fisheries are extensive, and there are two capacious roadsteads and a good quay at Port-nafeamin, the harbor of the island. The ruins of a stronghold of the early lords of the isles are situated in the middle of a lake on this island. Colonsay and Oronsay were among the early monastic stations, and next to Iona thev contain the most famous remains of reli-gious edifices in the Hebrides. - Little Colon-say, an islet between Staffa and Gometra, affords good pasturage for sheep, but contains few inhabitants. A River Of Texas - Colorado, rising in Bexar district, between the 32d and 33d parallels, about lon. 102° W. It flows successively S. E., E., S., and again S. E., and empties into Matagorda bay. Its lenghth is over 900 m.; average width 250 ft. The only important tributaries are in the upper part of .its course, where it receives from the S. W. the Rio Concho, San Saba, and Llano, and from the N. W. Pecan bayou. In winter it is navigable for steamboats to Austin. It flows for more than two thirds of its length through a highly fertile region, and is a beautiful clear stream. It owes its name to an interchanging of the names of Colorado and Brazos, which the first discoverer bestowed on these neighboring streams, calling the present Colorado the Brazos de Dios, and the present Brazos the Colorado or ruddy.